Today is the first ever UK National Emetophobia Awareness Day - yippee! Unfortunately, I only found out about this yesterday, otherwise I would have pushed it a heck of a lot more on Facebook and Twitter, however, with it being the first ever day of its kind, I hope that more people will be made aware as time goes on. I've decided that as an 'emetophobe' myself, posting a blog today was almost a necessity for me. Despite the fact I have about a 101 things I need to be doing right now (only a tiny exaggeration), it's important that more people are educated and made aware of this potentially debilitating phobia. Before I continue, please note that this blog post does use words which some may find potentially triggering. Always look after yourself first and foremost. Emetophobia is the intense fear of feeling or physically being sick and/or of other people around you feeling/being sick. There are also several 'subcategories' which you might come across upon researching emetophobia, such as the fear of being sick in public or the fear of being nauseated. Despite the fact that emetophobia is not commonly diagnosed, it is an extremely common anxiety disorder. Statistics vary, but most suggest it is between the 5th and 6th most common phobia. It tends to be much more common in women than in men. It can occur at any age, but many adults with emetophobia tend to report having experience symptoms of this phobia for as long as they can remember. When a traumatic scene is witnessed as a young child (between the age of 1 to 6 years old in my experience) the subconscious mind as the body's 'protector' works out the best way to prevent the incident repeating itself. The way this works in practice is that the subconscious attaches negative emotions or feelings to vomiting and in future this teaches the person to steer away from 'dangerous' situations. Whilst the subconscious is doing all this 'protection', the conscious mind is struggling to find out where this irrational behaviour is coming from. Rikard (2011) also theorised that emetophobia may come about as a secondary response to a negative situaition (in one presentation, Rikard uses the example of someone vomiting during a severe storm, and results in the individual associating the frightening events of the storm with the act of vomiting). Evidence tends to suggest as well that if you have grown up with your parents or guardians living with emetophobia (or a similar fear or certain anxiety disorders), you are more likely to suffer from it yourself. Safety behaviours such as carrying anti-emetics (medication to prevent vomiting), hand sanitisers, mints/chewing gum, a plastic bag "just in case", tissues to open door handles, etc. This is most definitely not an exhaustive list but I hope it gives just a small insight as to what an individuals with emetophobia might experience. What impact does this have on an individuals life? They may not receive the support they need through misdiagnosis - many people with emetophobia have been wrongly diagnosed with anorexia nervosa (due to the little amount of food they may intake through fear of contamination or nausea from too much food) or socal phobia, for example. Secondary mental illnesses may become apparent such as depression, especially if an individual feels that are not able to look after a loved one or a child when they're ill for example. The constant anxiety can be extremely tiring, as many individuals with emetophobia are on constant high alert. This can result in a variety of other health conditions such as IBS, which then actually feed the emetophobia even more. Emetophobia is often treated in ways similar to other anxiety disorders. It could involve CBT (cognitive-behavioural therapy) or gradual exposure therapy. This must be managed with the individual being in control of their treatment though, as understandably, those with emetophobia are unlikely to want to 'face their fears' and be exposed to vomit, no matter how gradual it may be. Evidence does suggest that this type of treatment DOES work though, so ensure you have a good therapist that you feel confident to practice this with. Many people have also said that hypnotherapy can help with symptoms, but it can be an expensive form of treatment. There may also be the option of medication for some people, and whilst this will not cure the emetophobia, it may help with someone of the physical sensations of the related anxiety. Where can I go to find out more information and get help? Anxiety UK- A great information source, and if you join as a member, you get access to discounted therapies. Also have a downloadable fact sheet for a small cost. Emetophobia Help - Anna Christie is a registered counsellor who has also recovered from emetophobia. Based in Canada, she is also able to offer therapy to anyone in the world via Skype. International Emetophobia Society - Claimed to be the Internet's largest online forum for those with emetophobia, it's a great place to meet and speak with fellow emetophobes for information, support and advice. Thrive Programme - The self-help programme mentioned earlier, put together by Rob Kelly. I have a good idea of when my emetophobia started - I can't remember my exact age, possibly around seven or so, and my grandad got food poisoning. There were other things in my life happening at the time which I believe, in conjunction with my grandad falling ill, mixed up some associations in my brain and I was left with the fear of sick. My grandad is one of the strongest people you'll ever meet. He's covered in tattoos, and tanned from working outside for years and years. Seeing him fall so ill must have been incredibly traumatising for me, but at the time, I didn't realise that. As a little girl, all I saw was how just a piece of food had made him incredibly unwell and I was petrified by this. If it did THAT to him, what the heck could it do to little old me? Growing up, I became more and more concious of people around me becoming unwell. If my sisters were ill, I would try and count down the hours until I thought I'd be 'out of the woods.' I remember the last time I was sick extremely well, but my phobia actually stops me from being able to share that experience. Just thinking about it for some reason makes my heart beat that little bit faster, and I worry that I'd be talking it up. Yes, to some that might seem a silly concept, but for me it is oh so very real. But I remember everything about that day. I remember the date, what I was wearing, what I had been doing that morning, what had happened that week. I remember the actual 'experience' and I want to cry just thinking about it, it frightens me that much. I remember little things when I was in primary school - things like making sure there was a good enough gap in front of where I was sitting cross-legged in the hall between me and the person in front, in case I did the Deed. I even recall a time where I tried to make excuses to not have my meningitus vaccination because I was so scared of falling ill. Throughout high school, I'd go most of the day without eating as after all, they don't have refigerators at schools for packed lunches. Whilst I was at school, I didn't have to worry about cooking so much. I'd often get my mum or dad to check my food, and see if it was cooked, but I mostly went on their word and ate whatever was put in front of me. As I've gotten older, my phobia has become worse, and I think I understand the reason for this. When I left school, I had more time and freedom to explore the wonders of the internet. As an adult, I've learnt about the wonders of anti-emetics. I can even buy them online, it's that easy. I've educated myself on incubation periods, methods of contamination, and what does and does not kill norovirus. I can't begin to describe how debiliating this phobia is for me. It means I'm pretty much tee-total, and if I do ever drink, I have to be feeling extremely confident that in the past week I've not put myself at risk of contamination, because if there is any risk, I won't drink alcohol in case I need to take an anti-emetic. This means my social life has suffered immensely over the years, especially as I'm only 22 years old (I've never even been tipsy let alone drunk). If I don't have my hand sanitiser on me, I won't eat, even if I have already washed my hands with water so hot (for twenty seconds) that steam is coming off of them. I struggle to eat out in restaurants, and will only ever go for somelike like beef or pasta. Other meats are mostly out of the question (unless they're smoked) along with salads and sandwiches. The thought of having children is something that plays havoc on my mind. I love children, I've always wanted children, but I struggle with the fact that I am likely to have morning sickness and I'm even more petrified of the fact that I won't be able to look after my children when they inevitably catch a tummy bug or something. Whilst the warmer months do tend to generally mean there is a decrease in the reported levels of norovirus and other tummy bugs, this phobia lives with me every day. I think about it every hour, of every day, without fault. Heck, I sometimes even dream about it. I am constantly concerned about contamination and every time someone even just mentions feeling off or the fact that their cousin from South America visited six weeks ago had a mild upset stomach just frightens the life out of me. I will think about it over and over and over again, until I end up getting myself in such a state that I end up crying my eyes out due to the unwanted anticipation of potentially falling ill. The stranger thing that I have come to recognise about my phobia though is that I don't know how I feel about being recovered from it. Yes, that sounds daft, but I think it's become such an entrenched part of me that changing it would actually not only be incredibly difficult, but I am frightened of not having that safety net. I suppose the point of overcoming such a fear though would mean that I obviously wouldn't feel that way eventually, but for now, it's me and it's who I am. So if you ever speak to someone who has a fear of being sick, please don't be judgemental. It's easy to respond with 'well just make yourself sick, then you'll be fine' or 'but no one LIKES to be sick' but please remember the impact of your words. Those with emetophobia can feel incredibly isolated and alone, and comments like these only build on stigma and ignorance through lack of understanding. 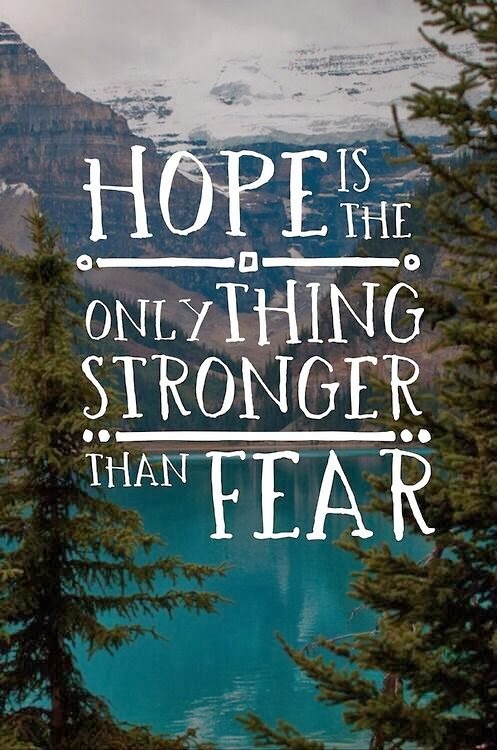 The one thing us emetophobes must hold on for is hope. We must remember that recovery IS possible, and this debilitating condition can be treated. Even in the darkest of moments, hold on to that tiny little ray of hope, because it is that that keeps us moving in the right direction, no matter how small the steps are.